We're currently working on our pirate forces for the Solar Empires setting. I came across on old Necron sprue from Games Workshop and I thought I would see if I could come up with a war bot design. 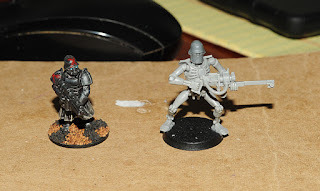 I looked over my Wargames Factory Shock trooper sprues and saw the helmet version with the clunky looking face plate. I've never cared for this helmet on troops but I thought it might be a good option for this project. This is my mock up. I'm using the Shock troopers for generic Jovian troops as well as for Jovian associated forces like the X-Patriot Pirate trooper in the picture. I've decided these would be good heavy or medium war bots for my Jovian associated forces. I'm pretty happy with the mock up so I will probably go down to the local game store and pick up a box of Necron Troopers to make a squad or two of these for my X-Patriot pirates. I think that looks pretty good. Fits with the trooper, without being too huge. Not really sure what I am doing with the gun yet. I've lots the inserts to this old gun so I am trying to decide what exactly what to do with this model but it did give me an idea of how the end result would look. Maybe make it into a tribarrel rotary cannon? something about the pose with the missing glow insert made me think of that.